Please click on the following links to review the answer. -F.A.Q: Why Is Windtightness Important? Sustainable design and construction to achieve low energy, PassivHaus and zero carbon homes are now at the forefront of the building and planning process. Codes and standards are in place which aim to reduce carbon emissions and create homes that are healthier and more sustainable. The only way to achieve PassivHaus, low carbon and zero carbon buildings is to ensure a high level of airtightness is attained. That means designing and installing a continuous seal around the internal fabric of the external envelope to eliminate unwanted draughts. Once the airtight vapour check is in place and sealed with flexible and durable tapes, seals and glues, it ensures that the insulation functions to its optimum performance, saving energy and drastically reducing carbon emissions for the lifetime of the building. The airtight vapour check also ensures that interstitial condensation risk is minimised, ensuring no structural damage from moisture, mould, rot and damp. To achieve maximum thermal efficiency the insulation must be completely sealed on both sides. 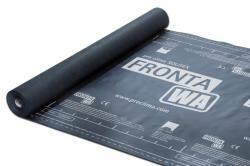 The insulation is protected against the elements on the roof by SOLITEX PLUS membrane and on the walls by the SOLITEX FRONTA WA range of membranes. The construction is now windtight externally and airtight internally, similar to wearing a windbreaker over a woolly jumper - perfect!